By using IRt/c sensor technology, a dramatic increase in high quality output of web processing can be achieved. A common problem in high speed manufacturing of packaging films, paper and textiles, is dryer oven control for high speed drying of adhesives, inks and coatings onto the material. With transparent films, IR sensors tend to “see” right through the film. And the amount of “see through” can vary with the thickness and composition of the film. With metallic films, IR sensors tend to see mostly reflections. These reflections can vary due to the surface condition and composition of the metallic component of the particular film. Measuring the true temperature of transparent and reflective films is extremely difficult, even with expensive IR sensors with special filtering. Measuring the drying process, however, is easy with IRt/c sensors. The key to measuring the drying process of webs is to use multiple IRt/c sensors to get a relative temperature profile. Multiple IRt/c sensors installed in the dryer, allow you to controll the drying process with the utmost precision. Because the IRt/c can see this thin layer, it then becomes easy to use multiple sensors to graphically, or numerically, display a “trend” of what occurs on the surface of the web. It is this “trend” that is important in controlling the drying. A trend plot of relative temperatures in a drying process will always show a lower relative temperature while the coating is drying. The heat energy of the oven, goes into evaporating the carrier of the coating, so the relative temperature indication by the IRt/c is “lower”. As soon as the coating becomes dry, however, evaporation stops. The heat energy of the oven then goes into heating the coating and substrate. 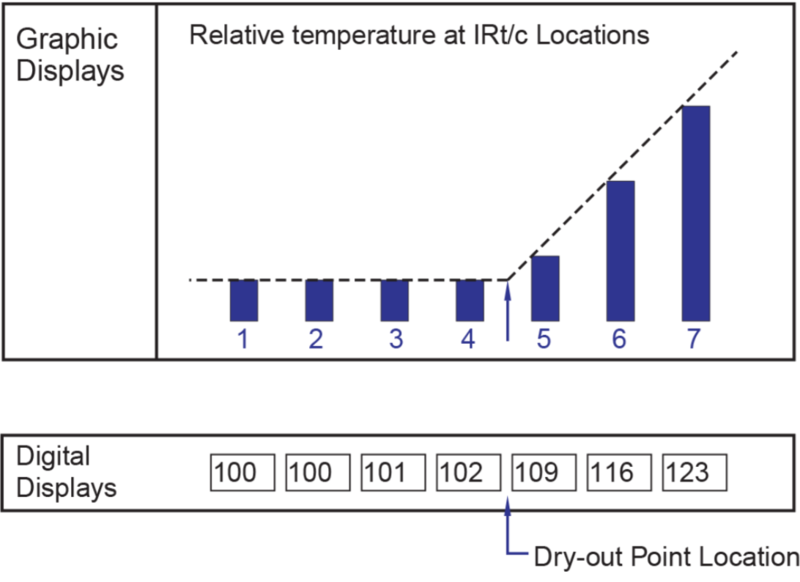 The relative temperature indication by the IRt/c becomes “higher”. These “lower” and “higher” relative temperature indications of the drying process by the IRt/c sensor are totally independent of the emissivity and transmissivity problems for “see through” and “reflective” films. Because of this, the relative temperature information of the IRt/c sensors can reliably be used for accurate drying control. For opaque, non-metallic web materials such as paper and textiles, the IRt/c sensors will also display true web temperature along with the trends. Install each IRt/c with an IRtc.2132 controller/display unit, or with an appropriate data acquisition display system, (or other means of display). No calibration is necessary for relative temperature data. The machine operator can then quickly observe the relative temperature trends shown by the IRt/c’s and decide if, and where, the web is being dried. To make a decision, the operator simply looks for the characteristic relative temperature change, sensor to sensor, to see where the evaporation process stops. If the sensors show relatively little change, (sensor to sensor) all the way through the oven, then the web isn’t being dried (i.e. evaporation isn’t complete). If the sensors show a steady increase in web temperature from the first sensor position, then the coating is missing, or, is drying so fast that overdrying occurs (and wasting energy!). 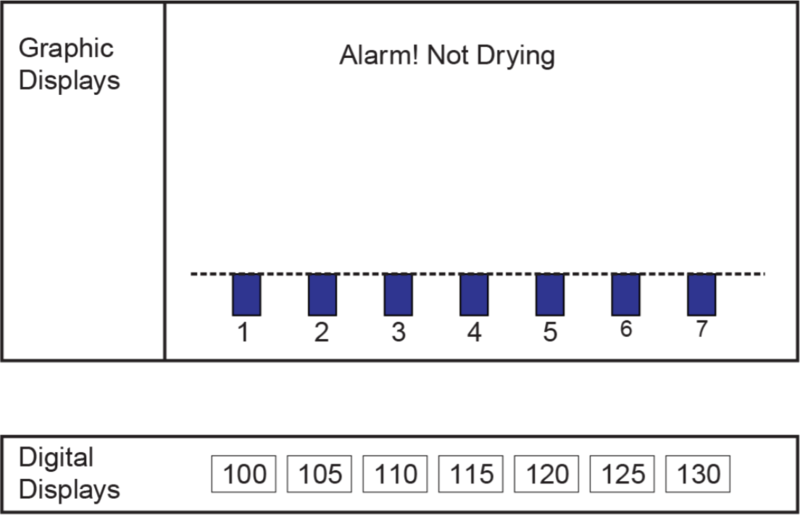 Using the sensor display information, the operator can then manually adjust the dryer controls so that the web dryout point is both moved to, and maintained within, the desired location inside the dryer.Manual adjustments based on our sensor display information allow the user to maximize production efforts while minimizing energy costs. ((T3-T2)-(T2-T1)), ((T4-T3)-(T3-T2)), ((T5-T4)-(T4-T3)), etc. These calculations represent the change in “slope” from sensor-to-sensor for relative temperatures of each sensor. The maximum value found for ((T3-T2)-(T2-T1)), ((T4-T3)-(T3-T2)), ((T5-T4)-(T4-T3)), etc., tells precisely where the “dryout point” of the web is occurring in the oven. With some quick tests on actual product, the program can be further refined to fit the drying profiles more precisely, such as setting a minimum or maximum value for the changes in slope for startup conditions, high speed, etc. 1. Select enough sensors to give relative temperature indication over the length of the oven. For maximum control of long ovens, we recommend at least one sensor every 20 inches (0.5 meters). 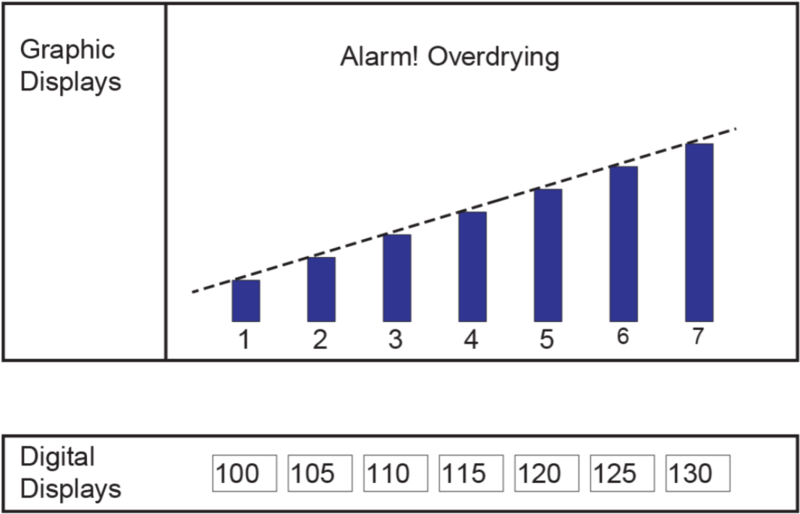 For compact, high speed drying ovens where control has to be very precise because drying must occur within a very short distance on the web, we recommend sensors be spaced about every 6 inches (15 cm), or less. 2. We recommend that the sensors be installed right inside the oven, if possible, as close as possible to the web. By mounting sensors close to the target web, other minor sources of IR errors are minimized. 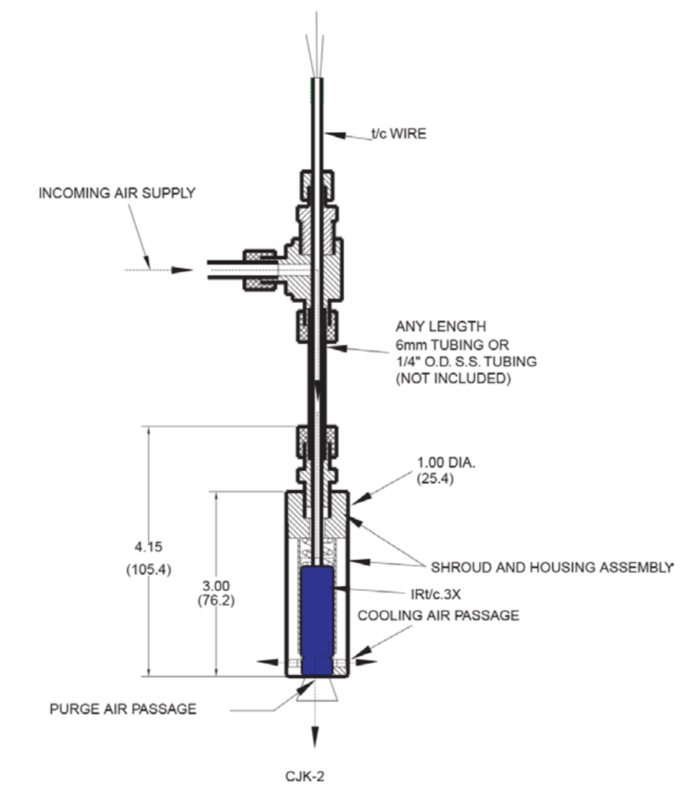 (IRt/c sensors can be installed inside drying ovens up to 750 F (450 C) with air cooling alone.) We recommend using the IRt/c.3X model for web drying. If this is not possible, IRt/c’s can be installed outside the oven, looking through a sight tube at the web. Select an IRt/c model with a field of view that can look down the sight tube at the web. 3. For internal oven air drying temperatures up 212 F (100 C), the sensors can be installed inside the oven with no air cooling. Select the IRt/c.3X (or IRt/c.3SV for tight spaces) sensors and use the built-in air purges to keep the sensor window clean for zero maintenance. 4. For internal oven air drying temperatures above 212 F (100 C) select the IRt/c.3X sensor with the CJK-2 (air cooling jacket kit). This combination will allow the sensor to be kept clean and cool in up to 750 F (450 C) drying ovens with air only. The rugged IRt/c sensors need no power supply, no periodic calibration, and are designed for years of trouble-free operation with all types of dryer ovens. For additional technical assistance, please contact Exergen.